Students are encouraged to pursue personal excellence in their learning. We value respectful relationships and pride in our school community. We have a hands on approach to learning in Science. The school uses Google Apps for Education across all subjects. Welcome to the Lanyon High School website. Our school is a community that fosters excellence in learning, inclusivity and active citizenship. At Lanyon High School we value student empowerment, respectful relationships, pride in our community and resilience. Our high expectations of all members of our school community ensure that Lanyon High School has a strong culture of learning and respectful relationships that focus on giving. Our commitment to the care, wellbeing and growth of every student ensures that the school has an excellent record of achievement in academic, cultural and sporting endeavours. A group of year 8 students went to the ANU to help mentor younger year 6 students, we helped with biology, robotics and chemistry. For the biology groups we walked to two different creeks and collected water in buckets. We tested it using turbidity tubes, pH paper and looked at the aquatic invertebrates under a microscope. The second project was programming robots and coding. For this we helped the primary students code their robots to complete certain tasks by using things like colour sensors. Our final project was chemistry where we had to dye fabric using only vegetables. We helped the students choose the vegetables and equipment, boiled them with water and placed the fabric in to the mixture to soak. At the end of the day we had experienced a variety of STEM activities and got to know some of the year 6 that will be joining us next year. We had a great day and it was exciting touring the university labs and using their equipment. 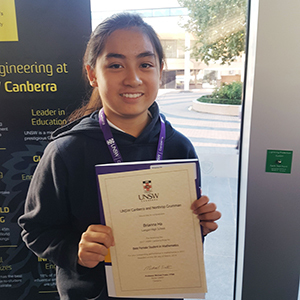 On Thursday March 8th, UNSW Canberra presented the Best Female Student in Mathematics Award to years 8 and 9 brightest. The award was to recognise the outstanding work completed by those in 2017. 54 girls representing 27 schools across Canberra came first and received $250, while those placing second and third received double pass movie vouchers. Winners also received a $5000 undergraduate scholarship if they choose to enrol in a Bachelor of Engineering degree. 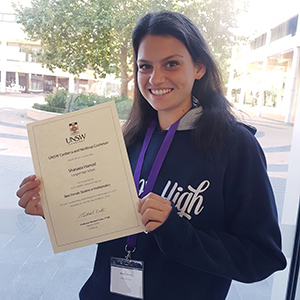 By awarding young female students, UNSW Canberra hopes to encourage more women in continuing their studies in STEM fields and ultimately, pursue a career. The event was also held on International Women's Day. The young ladies were welcomed by guest speaker Ms Narelle Devine who spoke about the future of women in IT, Digital Security, Cyber-safety and Anti-Terrorism. Brianna and I enjoyed a morning tea after and an array of STEM activities were also available for the guests to explore. It was extremely kind for UNSW to acknowledge young females in male dominated fields, it certainly would encourage young women to explore science, technology, engineering and mathematical fields in the future. The Principal and staff of Lanyon High School invite all parents and students to our open evening. An opportunity for prospective parents and students to tour the school, view activities in curriculum areas, and meet staff and current students. Lanfest was a huge success. We had a large crowd of parents, friends, students and community members here to see the fantastic work our have done throughout the year. We would like to thank all of the staff, stallholders, cluster primary schools and our fantastic P&C for the contributions. We raised just over $2000 which will go towards a school based project. Keep an eye out in the next newsletter for more specifics on what this project will be. The big LanFest Raffle and the auction of the signed Socceroos shirt were a huge success, raising $391 for our P&C who directly support our students’ learning. All prize winners have been notified by phone.